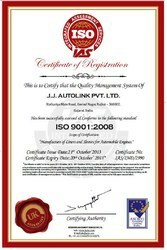 J. J. Autolink Private Limited, an ISO 9001:2008, one of the leading manufacturers, suppliers and exporters of this impeccable range of Engine Cylinder Liner & Sleeves, began its working in the year 2009. The finest Cylinder Liner, Compressor Cylinder Liner and Cylinder Sleeves, having a high preference in the market, make up this range. Manufacturing of this range is done, abiding by the set industry norms and guidelines and utilizing high grade raw materials and modern machinery. This ensures the product’s dimensional accuracy, sturdiness, durability and resistance to corrosion. In addition, this range is priced at a market leading rate. Laced with all the machinery and amenities needed, our futuristic state-of-the-art infrastructure at J. J. Autolink Private Limited, has helped the firm, maximize its production capacity and attain several of its predefined goals and objectives. In order to maintain and boost the firm’s position in the market, we keep upgrading the facility regularly. We have parted the facility into several units, to manage the firm’s operations in the best possible manner. Further, our ethical working habits and abidance of industry norms, has helped us generate a huge and highly reputed client base. Under the supervision of our Marketing Manager, Mr. Sam M. Patel, we have managed to conquer several heights of success in the 19 years of our existence. His managerial skills, ability to understand the market and make commendable decisions, have helped us smoothen our path. We are exporting our products in Saudi Arabia and UAE. Our team of highly skilled and experienced professionals put in all of their skills and efforts towards the attainment of several of the firm’s predefined goals and objectives. These professionals are recruited on the basis of their skills and experiences. To manage their operations in the best possible manner, the facility has been parted into several highly operational units. Further, these units in the most efficient and effective manner, helps us in maximization of the firm’s production capacity. We at J. J. Autolink Private Limited, are known to be one of the leading manufacturers, suppliers and exporters of this impeccable range of Cylinders Liners & Engine Parts. To maintain this standing in the market, we indulge in the utilization of the finest raw materials and modern machines, as per the set industry norms and guidelines. This ensures the product’s sturdiness, durability, dimensional accuracy and standard of quality. In addition o this, the offered range is known to be delivered with high level of punctuality and is marked at a market leading rate.